This report offers a comprehensive forecast of the global insomnia treatment market between 2018 and 2026. The analysis demonstrates market opportunities and trends in the Global Insomnia Treatment Market, which would further influence the segment. The global healthcare industry has been receiving positive nudges from reformative and technological disruptions in medical devices and pharmaceuticals segments. This report encompasses the global insomnia treatment market performance in terms of revenue contribution from various segments and also gives an overview of the insomnia sleep disorder, sleep aids and other definitions. Macro-economic factors influencing growth of the insomnia treatment market along with detailing opportunity analysis of market are also outlined. A rapidly multiplying geriatric population; increasing prevalence of chronic ailments, growing awareness among patients; and heavy investments in clinical innovation are just some of the factors that are impacting the performance of the global insomnia treatment market. The global insomnia treatment market is segmented based on drug type, distribution channel and region. On the basis of drug type market has been segmented as OTC drugs and prescription drugs. On the basis of distribution channel market has been segmented as hospital pharmacies, retail pharmacies, e-commerce and drug stores & hypermarkets. A detailed analysis has been provided for each region in terms of market size, Y-o-Y growth rate, absolute $ opportunity, and market attractiveness index. The report also gives a comprehensive overview of the regional market dynamics along with key growth driver, restraints, and trends pertaining to each region, which can be useful to understand the investment and collaboration opportunities in major countries. Key regions assessed in this report include North America, Latin America, Europe, Asia Pacific (APAC), and MEA. This section is included in the report to provide insights on the key players in the global insomnia treatment market and is primarily designed to furnish a detailed comparative assessment of service offerings and strategies of key providers specific to market segments. 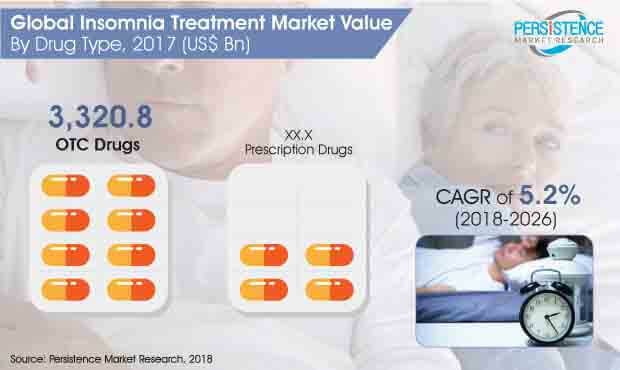 Detailed profiles of players in insomnia treatment market are also provided in the report which highlights company description, product/segment overview, SWOT analysis, financial information, key developments related to market and strategic overview. To arrive at the market size, Persistence Market Research considered parent market statistics i.e. stem cell market in each region and share of insomnia treatment market. A bottom-up approach was used to validate the total market size obtained. The report provides total revenue of insomnia treatment market over the forecast period 2018–2026. While forecasting the market size, several factors such as approvals for insomnia treatment drugs, R&D investment by major players, and consumption of drugs by different end users have been considered. However, to quantifying the market across the aforementioned segments and regions, market expectations and opportunities have been considered. In addition, we have taken into consideration the year-on-year growth to understand the predictability of the market and to identify the right growth opportunities in the global insomnia treatment market. Increase in the cases of insomnia, including the ones that go undiagnosed, is a severe public health concern. While effective and affordable treatment options are available in the global market, approximately 25% of adult population already suffer from sleeping disorders, of which around 6-10% have been diagnosed with insomnia. With increased prevalence of insomnia, a growing number of patients is seeking pharmacological treatment. Presently, numerous options are available in the insomnia treatment market; however, research continues to be on the bandwagon, to seek newer pharmacological treatments. As suggested by a recent conducted research study by Persistence Market Research, the global insomnia treatment market is projected to register a promising CAGR of 5.2% in terms of value during the forecast period 2018-2026. By the end of 2026, the market will possibly reach over a value worth US$ 7.5 billion. Millions of people are suffering from sleep-related disorders, and a majority of them have been preferring the OTC sleep medicines. According to United Nations, population in the age group of 60 years and above is projected to grow by 56% by 2030, which indicates that there is a growing geriatric population. Majorly, this factor will increase the demand for OTC insomnia therapeutic, since this population base is more susceptible to sleep deprivation. Commonly, OTC sleep aid such as natrol melatonin and unisom sleep gel that has minimum side effects dominate the global insomnia treatment market. OTC drugs are expected to represent the maximum share of the market revenue through 2026. As the need for improved treatment is increasing, leading pharmaceutical companies are focusing more on conducting vigorous research to find newer treatments. Several unique pharmacological categories, including neurokinin1 receptor antagonist, 5-HT1A agonist, 5-HT6 antagonist, H3 agonists, corticotropin-releasing hormone antagonists, cytokines, glutamatergic antagonists, and adenosine enhancers, are being investigated in order to introduce improved treatments to the market, in near future. To treat chronic insomnia, cognitive behavioral therapy for insomnia (CBT-I) is also found to be a highly effective therapy, especially for older adults. Some other therapies used for the treatment of insomnia include Stimulus control therapy (SCT), Sleep-restriction therapy (SRT), Relaxation therapy, and Sleep hygiene and education (SHE). Developing countries such as China and India are expected to witness a growth in demand for healthcare facilities and sleep aids over the next few years. This would eventually create a series of opportunities for leading manufacturers, planning to expand in these regional markets and attain higher market shares. An expanding undiagnosed insomnia patient pool suggests that there is a clinically significant level of insomnia among global population, which prompts at the critical need for improved recognition, diagnosis, and treatment. According to the research, billions are being spent on sound sleep. The booming multi-billion dollar sleep-health economy is an answer to the increasing number of insomnia cases, eventually opening an array of beneficial market opportunities for both private and consumer-oriented pharmaceutical companies, manufacturers, retailers, and health service providers.